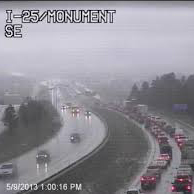 See The I-25 South Gap Project website. There were 5,537 crashes from 2011 to 2015 (from C-470 to Colorado Springs) . The top causes of crashes are rear-end and sideswipe collisions, with most crashes occurring on Saturdays. The highest number of crashes happen June, July and August. Of 15 fatal crashes between 2011 and 2015, over half involved alcohol or drugs. 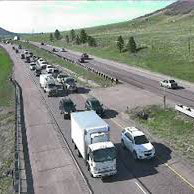 "The Gap" is an 18-mile stretch of I-25 between Monument and C-470 that has not been upgraded since the mid 1950s. 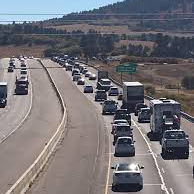 Eighty percent of all crashes are rear-end, sideswipe in the same direction and fixed-object crashes (from C-470 – Colorado Springs). The highest number of crashes occur over the summer in the mornings (7 a.m . and 8 a.m., and at 3 p.m. and 4 p.m.). The Gap has higher-than-average weather-related crashes and animal-vehicle collisions. Narrow shoulders and more than 1,000 feet in elevation gain can make for challenging conditions. Growing congestion and a road not built to handle an average of up to 87,000 vehicles on a weekend day contribute to crashes and closures. CDOT is on an aggressive track to improve the road and will be ready for construction by summer 2019 if funding is available. Mind your space—Allow plenty of room between your vehicle and the one ahead of you. Mind your blind spots—Make sure you are clear before switching lanes to prevent sideswipes. Mind your speed—Drive the posted speed limit. Mind the unexpected—Speeds, construction, weather and wildlife can change road conditions quickly. Mind the latest information—Plan ahead and know before you go. Visit cotrip.org, or call 511 for the latest road conditions. Remember to Move It—The Move It law requires drivers to move minor accidents on interstates out of traffic to a safe location. Be Safe—Click it or Ticket! Buckle Up. Don't Get Distracted —Be smart. Pay attention to the road. 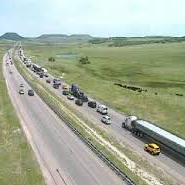 A project is in the study phase to identify immediate and long-term solutions to I-25 from C-470 to Colorado Springs. Improvements will greatly improve the safety, reliability and travel options for the corridor.